We are being hosted by the Cornerstone Church. They have been really good to us, with dinner last night before we made our presentation, then lunch today after the service. Thank you folks at Cornerstone! 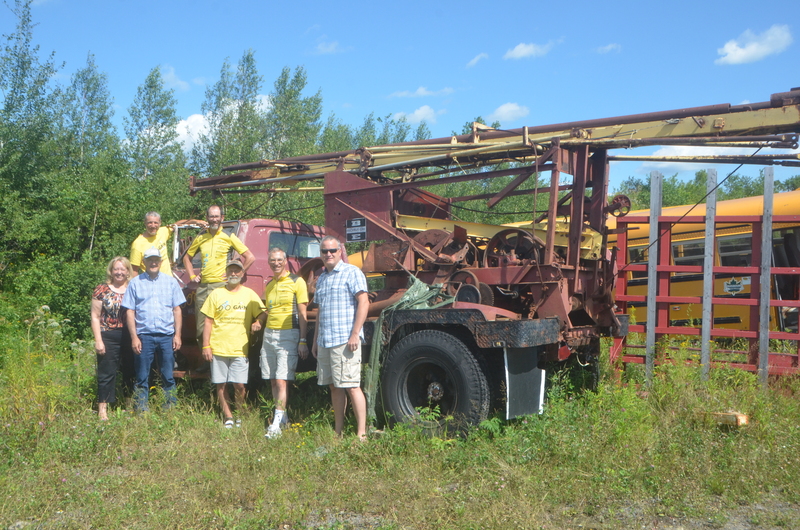 Today an amazing thing happened; a fellow at the service donated a drilling truck. He purchased it second hand a few years ago with the desire that it would be used in Africa. He ordered all the parts then his repair guy left town for work elsewhere. It has sat at the back of his car dealership since. So today he gave it to us! He said he will have it all fixed, painted and put it on a better truck and even pay to have it shipped to Africa. Wow! Thank you Jerry and Diane! After lunch we had the most wonderful relaxing afternoon. Our hosts live on the bank of the St. John River and have a pool. We really enjoyed the quiet afternoon. 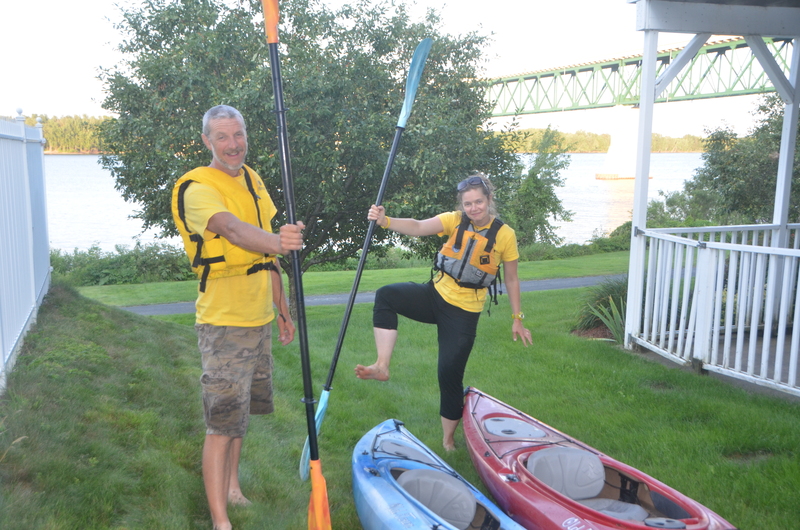 Jacquie and Richard did a little kayaking on the river. 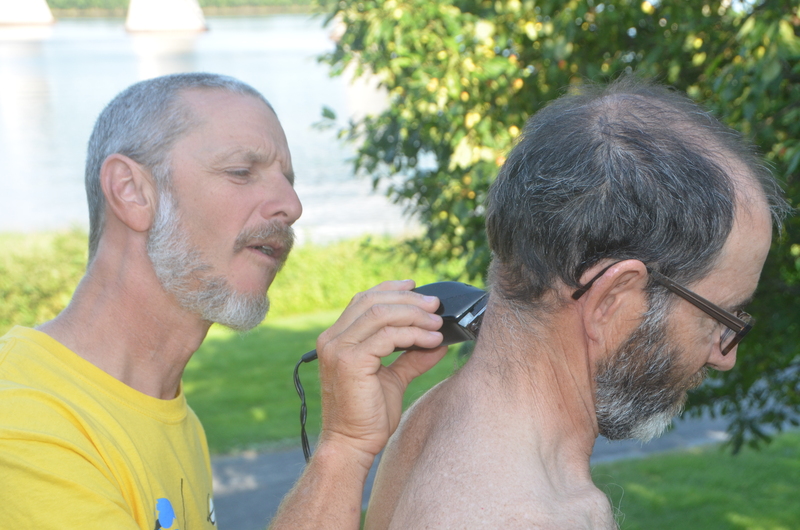 Richard got the clippers out so we all got a little trim except Jacquie. What a encouraging and relaxing day in Fredericton. Just what the doctor ordered. Please note that between Winnipeg and Sudbury cell coverage may be spoty and MapMyTracks will show us as if we are not moving until we get to a coverage area and it will appear as if we jump ahead and start moving again. Many, many thanks! My heart is filled with thanksgiving! Day 20 – Mission Accomplished! 33 out of 60 wells were provided in 2014. Help provide one of 10 new wells! Take the challenge and save lives!